What an absolute delight this family home is! Tastefully decorated and beautifully cared for throughout, this attractive two bedroom end terrace residence is a true credit to its current owners and one you can literally drop in your furniture and enjoy many years of care free living! Set in a good location not far from the amenities in Leasowe and Moreton as well as Wallasey Village, this includes local schooling, frequent bus routes, Leasowe train station and handy commuter links. Interior: inviting and neutrally decorated hallway, downstairs WC, well planned kitchen and living/dining room on the ground floor. Off the first floor landing there are the two bedrooms and tasteful modern bathroom. Complete with uPVC double glazing and gas central heating system. Exterior: sunny rear garden and pleasant front approach with small lawn and driveway. Viewing is absolutely essential in order to appreciate this lovely home in full; organise your viewing today! DOWNSTAIRS WC uPVC double glazed frosted window to front elevation. Low level WC and pedestal wash basin with tiled splash back. Central heating radiator and electric consumer unit. 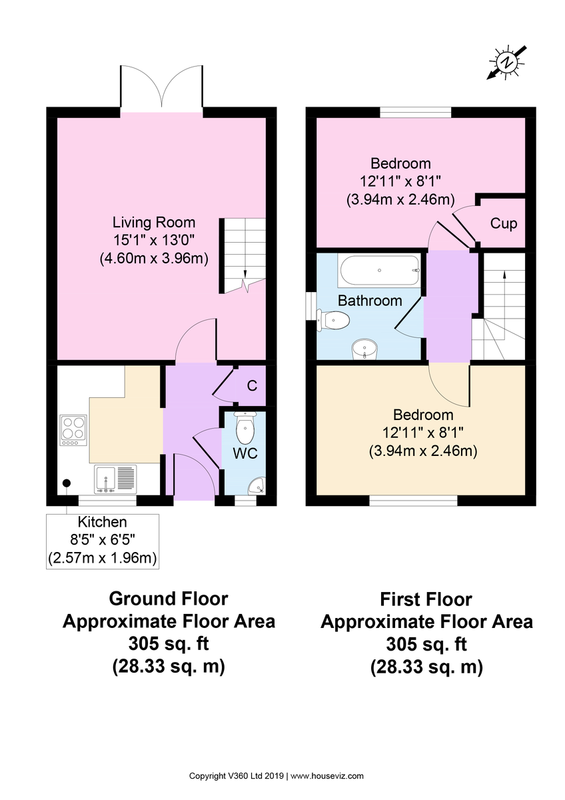 KITCHEN 8′ 05″ x 6′ 05″ (2.57m x 1.96m) Well planned tasteful fitted kitchen having uPVC double glazed window to front elevation. Matching range of base and wall units with contrasting work surfaces and matching roll backs. Sink and drainer with mixer tap over. Inset four ring gas hob with oven below and extractor above. Space and plumbing for washing machine. Space for fridge freezer. Vinyl flooring. LIVING/DINING ROOM 15′ 01″ x 13′ 0″ (4.6m x 3.96m) A lovely room for when relaxing in front of the television or enjoying family meal times together. Tastefully decorated and well-proportioned room. Television point, telephone point and two central heating radiators. Under stairs area and double opening uPVC double glazed doors into the garden. BEDROOM ONE 12′ 11″ x 8′ 01″ (3.94m x 2.46m) uPVC double glazed window to front elevation with fitted venetian blinds. Central heating radiator. BEDROOM TWO 0′ 0″ x 0′ 0″ uPVC double glazed window to rear elevation with fitted venetian blinds, overlooking the garden. Central heating radiator and handy storage/airing cupboard. BATHROOM Tasteful and modern bathroom with uPVC double glazed frosted window to side elevation. Suite comprising panel bath with electric shower over, low level WC and pedestal wash basin with tiled splash back. Extractor fan, central heating radiator and part tiled walls. REAR EXTERIOR A nice sized lawned garden with a sunny South Easterly facing aspect; ready to enjoy many hours of fun in over those sunnier months, especially hosting family BBQs. Paved patio for table and chairs set, fenced boundaries and side access gate. FRONT EXTERIOR A pleasant approach with a front driveway, small lawn area with shrub border and access to rear. INFORMATION Leasehold: £180 per year ground rent.